Again, I am living in an HOA Town Home (2 dwellings under 1 roof) so the only thing separating me from my neighbor is a concrete firewall between the two units. The next Town Home is 20 ft. away from mine. I knew when I bought my gear and having antennas in my 20’x20’garage attic that I would probably not be able to run over 30 watts max. 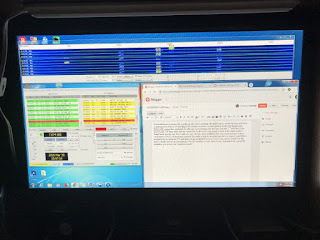 So my previous love for CW was rekindled and I also became interested in FT-8, WSPR and PSK 31 for the exact reasons you mentioned (best bang per watt). The good news is that I started out at 20 watts and slowly stepped it up to 30 watts, then 50 watts on SSB phone as well as the digital modes. After 3 months there were no complaints from my neighbors. I then purchased a CMC-130S-3k Common Mode Choke, RF Choke and RF Isolator all in one from http://www.MyAntennas.com. Since this choke cleans up your Tx RF and Rx I have noticed a drop of nearly 2 S-units of noise in my receive signal and much less RF interference in my radio room. So I decided to push my luck and try 100 watts. Still no complaints so far from the neighbors. Yay! But when using my 37′ OCF Dipole in the attic mainly for 17m, 20m, 30m I still keep the power down to 50 watts. When using my MFJ 40m mag-mount on my van in the driveway I use full power at 100 watts. I really believe adding the Common Mode Choke in line between my radio and antenna tuner enables me to use far more power as it helps suppress stray RF. Although each ones situation and living quarters vary, it just might be worth a try for some operators. If you like FT8 but want more interaction and more features then you should try JS8CALL. Good morning Jim, I have heard and did some reading regarding JS8call but have never tried it. This looks like a mode I could look into more during a relaxing evening with some tea. Thanks for stopping by Jim and have a great week. Good evening Gary, thanks for all the information in your post! You and I were in the same situation regarding townhouse living. I never did increase my power just did not want to take the chance. The CMC 130S-3K sounds like a really handy thing. I did go to the site and did some reading about it and to tell you the truth I had never heard of this unit. I was reading one review on eham that gave the unit a 3/5. The way I look at it if it can drop the noise level by around 2 dB that’s excellent. Thanks very much for sharing and have a great week…..what’s left of it anyway.